Back in the time of simple points-based ignition systems, dwell time of coils didn’t matter much. The time was set by the shape of the points cam – and that was that. But with programmable management, where the dwell time of the coil may be able to be specified, it matters a lot! 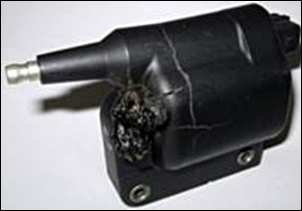 Too much dwell and you’ll melt your ignition coil – that’s what happened to the pictured unit. Too little dwell and you won’t get a strong spark. So what’s dwell all about, anyway? Dwell in ignition systems refers to the period of time that the coil is turned on. That is, it is the length of time that current flows through the primary winding of the coil. In old points systems, it is the time the points are closed. In modern systems, it is the time the driver transistor is switched on. So why does the current flow to the coil even need to be switched on and off? 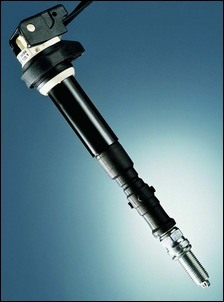 An ignition coil consists of two coils that are wound around the same iron core. The two coils are known as the primary and secondary windings. Secondary windings have thousands of turns of very fine wire that needs to carry high voltage (around 35kV is typical) but very little current (80mA is typical spark current). 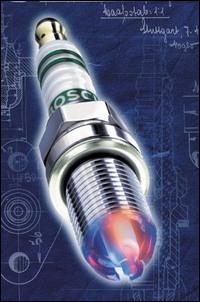 One end goes to the high tension tower that the spark plug is connected to, while the other is grounded or linked to the ignition terminal internally (very common). The primary winding has fewer turns of thicker wire as it carries a large current (7A is typical for a modern High Energy Ignition [HEI] system.) It has ignition voltage on one side (the + terminal), and the other (- terminal) is connected to a driver transistor. So how does the coil work? The primary winding is switched on and current begins to flow through it producing a magnetic field (this takes time to build up), with this magnetic field surrounding both coils. 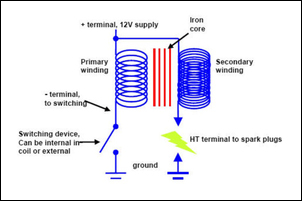 When the primary current is turned off, the magnetic field collapses rapidly around both coils and this induces a high voltage into the secondary winding to produce the spark. So it is the turning off the primary current that causes the magnetic field to collapse, so producing the pulse of high voltage that fires the plug. Inductive ignition systems store their energy in a magnetic field - correct dwell allows this field to reach its maximum strength within the design limits of the coil. If power dissipation in the coil exceeds design limits, the plastic bobbin melts and the epoxy filler breaks down. Expanding material and gasses then rupture the casing. As mentioned, the coil stores energy in a magnetic field and the level of this is dependant on coil current. The energy stored is measured in Joules and is half the inductance x the current squared. This means a small reduction in current makes a huge difference to energy (as it’s squared). Correct dwell control has a direct effect on current level and therefore energy stored. This pic shows an HEI coil at 13 volts and firing into a spark gap of 5 mm. The difference was the coil current of 2 versus 7 amps. The spark shown at left (2 amps primary current) could jump only a 6mm gap before extinguishing. The spark on the right (7 amps primary current) jumped a 22mm gap. To achieve these variations in current for this particular coil, the dwell time had to be altered by just over 3 milliseconds! That shows how critical correct dwell time is. 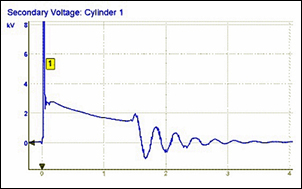 Another way to view the effect of low coil current is to see the effect on an engine’s spark duration. (Spark duration is the time the spark is ‘firing’ across the spark plug electrode). This is a good comparative indication of stored coil energy. For this demonstration, we fired the coil into a fixed spark gap while measuring the voltage and time. 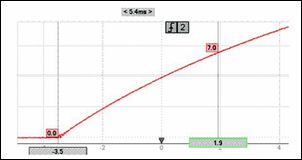 This graph shows milliseconds on the bottom axis and spark voltage on the vertical axis. With 2 amps of primary current, the spark duration was only 0.5 milliseconds. With 7 amps of primary current, the spark duration was 1.4 milliseconds – 2.8 times as long. Common ignition modules such as the Bosch BIM 137 (008), BIM 024 (021) units and Ford TFI have sophisticated closed loop control of dwell. These modules monitor the coil current and adjust the dwell to ensure the target level is always reached - about 7 amps is usual. This approach caters for varying RPM, temperature, voltage, coil tolerances, etc. Should the current rise above the target, then the module’s transistor will partially turn off to limit the current. When viewing the current trace, this can be seen as a ‘flat’ section on the top of the pulse. 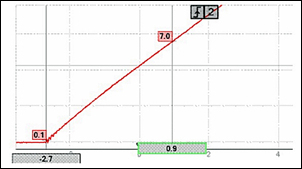 This graph shows shows BIM 024 current limiting, normal at low RPM. These modules are often used in aftermarket applications as they are very simple to set up (no dwell mapping required) and are readily available. They are a good choice if your ECU has limited control ability or you lack the coil dwell data or equipment you need to test the requirements yourself. Use coils that are compatible with the module (eg Bosch BIM 137 module works well with Bosch HEC715 or HEC716 coil). Do not use an inductive sensor triggered type modules (like BIM 024) with your ECU. Internally, these modules use the slope of the sensor input signal in their dwell setting process and if triggered with a square wave, they will not have dwell control available. Only use modules from Hall Effect systems (eg BIM 137). The Hall Effect triggered module type internally converts the square wave input signal (from your ECU now) into a saw tooth voltage and uses this new sloping signal in their dwell setting process. The amount they can adjust their dwell will be restricted If you do not give them a long enough pulse. You can’t alter the coil current limit if your application requires this. Dwell control at very low coil firing rates (eg an engine with one coil/module per cylinder at idle speed) may be outside its ability and so dwell is often way too long. Coil destruction results. The solution may be an aftermarket alternative such as those from M&W ignitions. This is when the ECU sets the dwell based on an internal map. The main variable is battery voltage – battery voltage has a major effect on the time needed to allow a coil to reach the target current level. The map has to be programmed correctly for the particular coil used. Nearly all production vehicles now use this method. Never substitute the coil for another type on a mapped system. The ECU will not know you have done this and will still turn the coil on for a certain time - if your new coil charges quicker (lower inductance), then the coil or ECU will be damaged. If a slower charging coil is fitted (higher inductance) you will get a poor spark. The ECU controls the switching transistor to turn the coil on for the exact time it needs to reach the desired current level before turning it off for the spark. The transistor may be mounted inside ECU, mounted externally, or even be built into the coils. Most coils that have the drivers internally built in have over-current protection. Some even have thermal protection that will reduce their heat dissipation temporarily until under control (eg Mitsubishi 380 vehicle coils). Never have your dwell set long enough so that the driver is clamping the current, seen as a ‘flat’ section on the top of the current trace when viewing. Drivers (note: not standalone ignition modules) are generally not designed to limit current in normal continuous operation and so they will fail very quickly. If you doubt this, just put an input signal into one constantly so it’s forced to limit the coil current - you can boil water with them! The appropriate dwell time depends on the individual ignition coil’s design characteristics (primarily, inductance) and supply voltage. The lower the supply voltage, the longer the dwell time needed. But how do you ascertain the appropriate dwell for a particular coil? There are two main approaches - testing a coil on the bench, or doing it in the vehicle. Bench testing coils will provide a wide range of good data, useful for future reference should you wish to experiment with different current levels. Bench testing also allows a large voltage range to be applied conveniently. Oscilloscope - almost any will do as it only needs a single channel and we’re measuring relatively slow signals. The ability to freeze the picture and measure with cursors is very handy and will save much time. A variable power supply (7 – 16V is the test range needed) that will not dip in voltage when the high coil demand is placed on it. (Most ‘switch mode’ supplies are very bad for this.) A large capacitor across the output terminals helps maintains voltage output, eg a 1 Farad capacitors as used in car stereo installations would work fine. Signal (function) generator, not necessarily essential - used to trigger the driver transistor. The coil to be tested needs to be powered from the variable supply and switched via the driver. A current probe and scope are used to monitor the coil current. The driver can be ideally triggered from the signal generator or even just ‘flashed’ on manually. Most drivers require a specific level of current to drive them (20 – 40 mA typically). Never apply direct power - at the very least use an automotive ‘test lamp’, equivalent small wattage globe or a resistor in series with the driver’s input terminal to limit the current. If you have basic electronics knowledge you can measure the voltage dropped across the driver and determine that it is fully on. If you do not turn on the driver fully (too low a drive signal) then the coil current will be limited and the driver will overheat. This can be an issue when setting up your ECU also, with many allowing you to set the drive current. MoTeC, for example, has a 20mA or 40mA selectable levels. Record the coil current rise time at particular supply voltages and note the time to reach various current levels. This is where the ‘freeze and measure’ ability of a scope can save lots of time. Be very careful testing - pulse the coil only briefly as there may be no protection at all (depending on your driver choice) and thermal dissipation will be high. Allow cooling time and check driver for temperature rise. This graph shows an HEI coil tested on a 10V supply. The rise time to 7 Amps is 5.4 milliseconds. 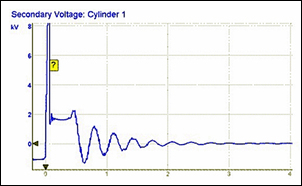 This graph shows the same coil tested at 13V. This time, the rise time to 7 Amps is a much shorter 3.6 milliseconds. We can use the above traces to check the time required to reach other current levels also if we wish. The difficulty with doing the testing on the vehicle is in being able to isolate the coil power supply so that it can be varied in voltage via an external supply. If you can achieve this by tapping in at the supply origin - and therefore using most of the existing vehicle’s coil wiring - the harnesses voltage drop will also be compensated. Engine operating temperature can also be achieved and calibrated. The job is made a lot easier with ECUs that incorporate a self-test where it can drive the coils at an adjustable frequency and period (eg MoTeC again). These systems can be varied to simulate different dwell times to observe the peak current level. This also ensures that any losses in the drivers and wiring are adjusted for. The only way to guarantee reliable service is to set the coil primary current to the same level that is used in the standard vehicles the components are used on. Vehicle and component manufacturers do many severe tests to check reliability. If you use aftermarket or cheap replacement coils, then you’re on your own! There are gains to be had by raising the coil current slightly but long-term component endurance will be a gamble. Manufacturers have to be conservative for a reliability margin and to allow for manufacturing tolerances; they really know their limits. If your ECU has the flexibility for more complex tables and you have decided to push the limits (or just want to guarantee reliability), you could reduce the dwell at high temperature, sustained load and high RPM. Configuring your modified car to have the correct dwell time is critical to ensuring coil longevity matched with excellent spark performance.